The evolution of larger brains in the last 3 million years played an important role in our ability as a species to think, problem-solve, and develop culture. But the genetic changes behind the expansion that made us human have been elusive. In a pair of papers publishing May 31 in Cell, two teams of researchers identify a gene family, NOTCH2NL, that appears to play an important role in human-specific cortex development and may have been a driving force in the evolution of our large brains. NOTCH2NL genes delay the differentiation of cortical stem cells into neurons, resulting in the production of more neurons across the course of development. 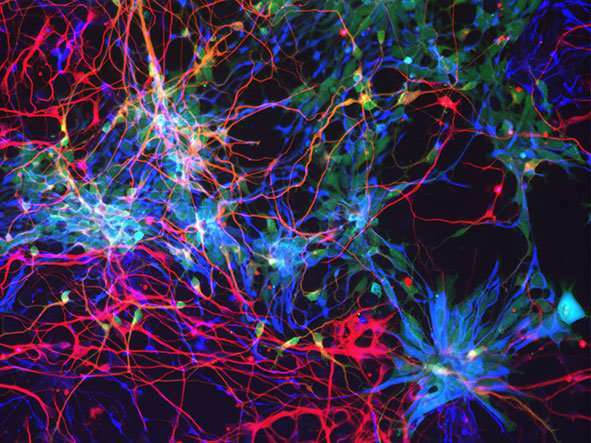 The genes are found exclusively in humans, are heavily expressed in neural stem cells of the human cerebral cortex, and are located on a part of the genome implicated in neurodevelopmental disorders. "Our brains got three times as big primarily through the expansion of certain functional areas of the cerebral cortex, and that has to be a fundamental substrate for us becoming human. There's really no more exciting scientific question that I can think of than discovering and decoding the mysterious genetic changes that made us who we are," says David Haussler, co-senior author of one of the papers and a bioinformatician at the University of California, Santa Cruz, and Howard Hughes Medical Institute. The team led by Haussler and co-senior authors Frank Jacobs of the University of Amsterdam and Sofie Salama of University of California, Santa Cruz, and Howard Hughes Medical Institute were comparing genes expressed during brain development in humans and macaque monkeys in stem cell-derived models when they realized that they could detect NOTCH2NL in human cells but not in those of the macaques. Looking at the DNA, they also didn't see it in orangutans and found only truncated, inactive versions in our closest relatives, gorillas and chimpanzees. Reconstructing the evolutionary history of NOTCH2NL genes revealed that a process called gene conversion was likely responsible for repairing a non-functional version of NOTCH2NL, which originally emerged as a partial duplication of an essential neurodevelopmental gene known as NOTCH2. This repair happened only in humans—and they estimate it happened 3-4 million years ago, around the same time that the fossil record suggests human brains began to expand. After it was repaired, but before we diverged from our common ancestor with Neanderthals, NOTCH2NL was duplicated two more times. The team behind the other paper, led by developmental biologist Pierre Vanderhaeghen of Université Libre de Bruxelles ULB and VIB-KU Leuven, arrived at NOTCH2NL from a related direction, searching for human-specific genes active during fetal brain development using primary tissue. "One of the holy grails of researchers like us is to find out what during human development and evolution is responsible for a bigger brain, particularly the cerebral cortex," Vanderhaeghen says. "Given the relatively fast evolution of the human brain, it is tempting to speculate that newly evolved, human-specific genes may help shape our brain in a species-specific way." Searching for human-specific genes involved in brain development proved challenging because these genes are typically poorly annotated in genome databases and hard to distinguish from more common genes present in other species. The Vanderhaeghen team developed a tailored RNA sequencing analysis for specific and sensitive detection of human-specific genes in human fetal cerebral cortex. This allowed them to identify a repertoire of 35 genes unique to humans that are active during development of the cerebral cortex in humans, including NOTCH2NL genes. They zeroed in on NOTCH2NL in particular because of the importance of its ancestral gene, NOTCH2, in signaling processes that control whether cortical stem cells produce neurons or regenerate more stem cells. And they found that artificially expressing NOTCH2NL in mouse embryos increased the number of progenitor stem cells in the mouse cortex. To better understand what the genes do in humans, the team turned to an in vitro model of cortical development from human pluripotent stem cells to explore NOTCH2NL function. In this model, they found that NOTCH2NL can substantially expand the population of cortical stem cells, which in turn then generate more neurons, a feature expected to distinguish between human and non-human cortical neurogenesis. "From one stem cell, you can either regenerate two progenitor cells, generate two neurons, or generate one progenitor stem cell and one neuron. And what NOTCH2NL does is bias that decision in a slight way towards regenerating progenitors, which can later go on to make more neurons. It's a small early effect with large late consequences, as often happens with evolution," Vanderhaeghen says. Haussler's team looked at what happened when NOTCH2NL wasn't expressed: they deleted it from human stem cells and used them to grow patches of cortex called organoids. In the organoids derived from NOTCH2NL-depleted stem cells, differentiation occurred faster, but the organoids ended up being smaller. "If you lose NOTCH2NL, it leads to premature differentiation of cortical stem cells into neurons, but at the same time the very important stem cell pool gets depleted," says Jacobs. 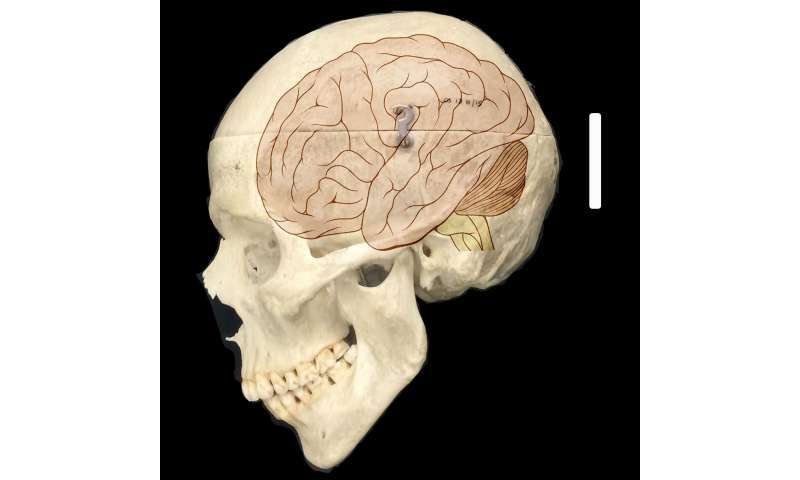 NOTCH2NL's location on the genome, incorrectly mapped until recently, is further support for its role in human brain size. Duplications or deletions at a genome region known as 1q21.1 are known to cause macrocephaly or microcephaly, respectively, and are associated with a range of neurodevelopmental disorders, including ADHD, autism spectrum disorder, and intellectual disability. Haussler's team looked at 11 patients with errors at this locus and found that NOTCH2NL was indeed being duplicated and deleted in the rearrangement events associated with larger and smaller brain size that resulted. "We really wanted the gene to be in the 1q21.1 disease interval, because it made logical sense, but in the incorrect reference genome, it wasn't. And then we found new data, and we realized that it was a mistake in the reference genome! It seldom happens that when you want something that appears to be false to be true, it turns out to actually be true. I don't think something of that level will ever happen again in my career," says Haussler. This part of the genome is simply challenging to sequence and read. "We've been looking under the lamppost in human genetics, as they say, by studying just the regions that were easy to sequence. There's a lot of information in these other regions, and there's a reasonable argument that they are the real cauldron for rapid change over the last few million years," he says. Because NOTCH2NL is something of an evolutionary trade-off between larger brains and 1q21.1 disease susceptibility, the researchers are all quick to point out that there is plenty of healthy variation here, too. "It's a boon that may have enabled us to get a big brain. And yes, it's a bane, because we can have these recombination events that can be bad. But what we found when we developed the technology to really sequence it in individuals is that there are multiple different alleles of this gene. And it's possible that that variation creates the subtlety and plasticity that is important in enabling humans to be human," says Salama. There are still a lot of unknowns when it comes to NOTCH2NL. Haussler's team points out that they were only able to look at the genomes of a small sample of patients and that their organoid models didn't address the later stages of cortical development, at a time when NOTCH2NL might be even more important. Another important question Vanderhaeghen's team wants to address is what other human-specific genes identified here (in particular, those also found in the 1q21.1 region or other genome areas associated with brain diseases) do during brain development. And although both teams were able to show that NOTCH2NL is involved in the well-studied Notch signaling pathway, Vanderhaeghen acknowledges that there is still uncertainty around the exact mechanism by which NOTCH2NL tips the balance between differentiation and regeneration. "What's amazing is that there are many signaling pathways that control the development of the embryo and are completely conserved between species. The Notch signaling pathway is the oldest one. You can find it in every animal you look at. It has been used by developing embryos for as long as animals have existed. And yet, there is a very recent innovation in this pathway specifically in the human lineage, through NOTCH2NL," says Vanderhaeghen. "The locus was building up instability throughout evolution, so the repair of these non-functional NOTCH2NL genes could have happened at any time," says Jacobs. "It could have happened earlier in the primate lineage and had a huge effect on brain development. But it didn't. There's a matter of luck or chance involved that just remains fascinating to me: how you go from something that is quite neutral in our genome to something that has such important function and is used by our species to select for such important properties." Just think, we are the lucky one to be able to annihilate every other dimwitted species. It just goes to show you that not every lineage can be this lucky. So... splice them into an ape fetus and see what happens. Yeah the only species full of individuals who hate it. Like yourself.